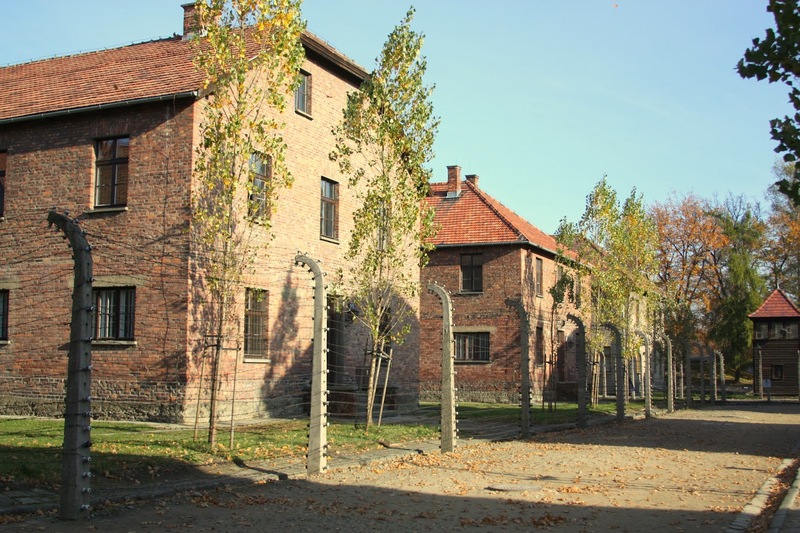 While in Poland, we traveled to Oswiecim, a small village 50 miles west of Krakow, the location of the Auschwitz and Birkenau concentration camps, the two main camps in this region of Poland. 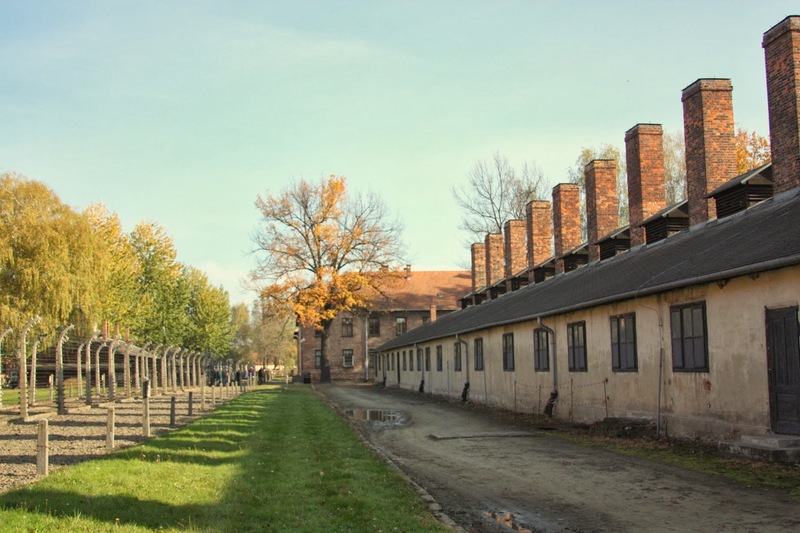 The entire complex of camps was referred to as "Auschwitz." The death toll from this place is sobering. Over one million people were murdered at Auschwitz. It was the largest Nazi German concentration and death camp. 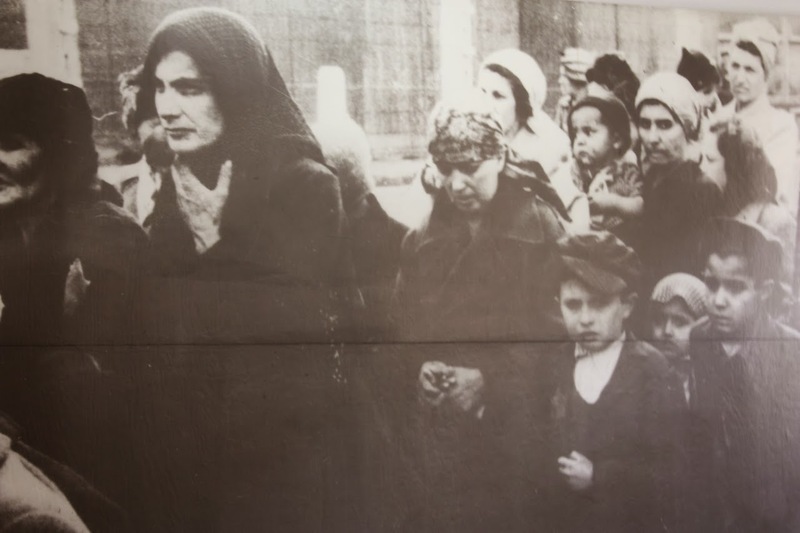 In the years of 1940-1945, the Nazis deported at least 1,300,000 people to Auschwitz, of which 1,1000,000 were Jews, 140-150,000 were Poles, 23,000 were Roma, 15,000 were Soviet Prisoners of War and 25,000 were prisoners from other ethnic groups. 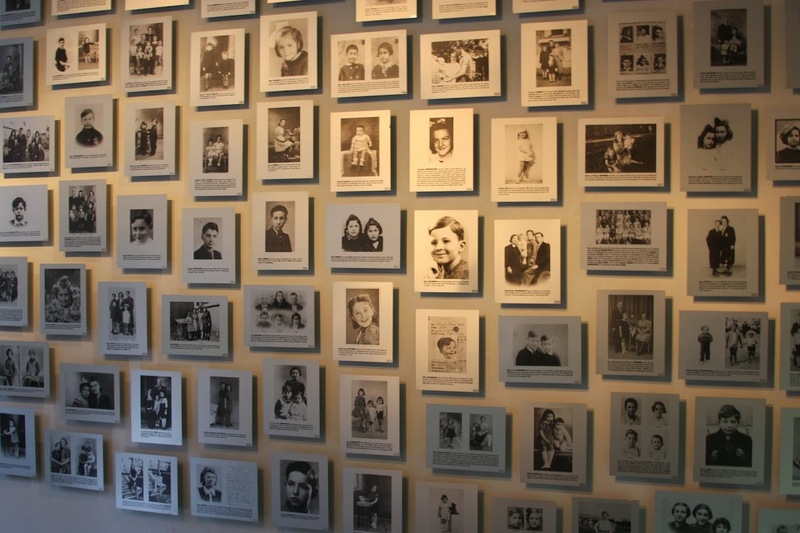 Approximately 1,100,000 of these people died in Auschwitz, about 90% of the victims being Jewish, the majority being murdered in the gas chambers of the camps. 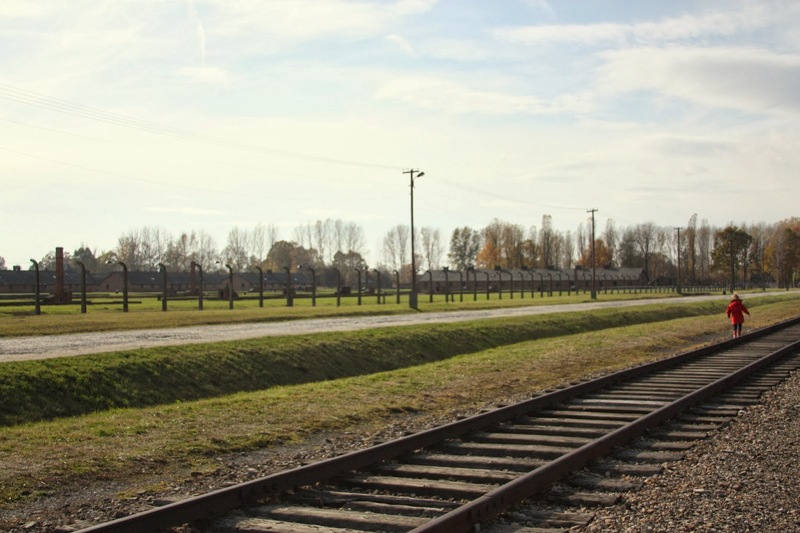 Visiting Auschwitz brought out powerful emotions for all of us. It suddenly brought to life everything we had ever learned about the Holocaust. To see it, you start to understand the enormity and egregiousness of the atrocities that a relatively small group of depraved, soulless human beings committed against their fellow men. We took Claudia and Patrick with us to the camps, but didn't take them inside any of the exhibits. They stayed outside while Russell and I took turns going in. Claudia asked what the place was. I kept it very simple, telling her it was a place where bad people took good people. 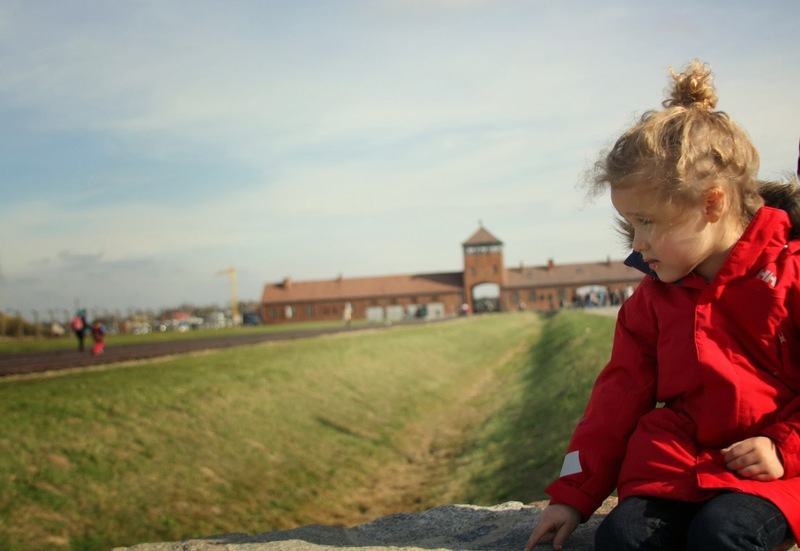 While trying my best to educate her, but protect her at the same time, I couldn't help but reflect on the 232,000 children who were stripped of their childhoods here at Auschwitz. 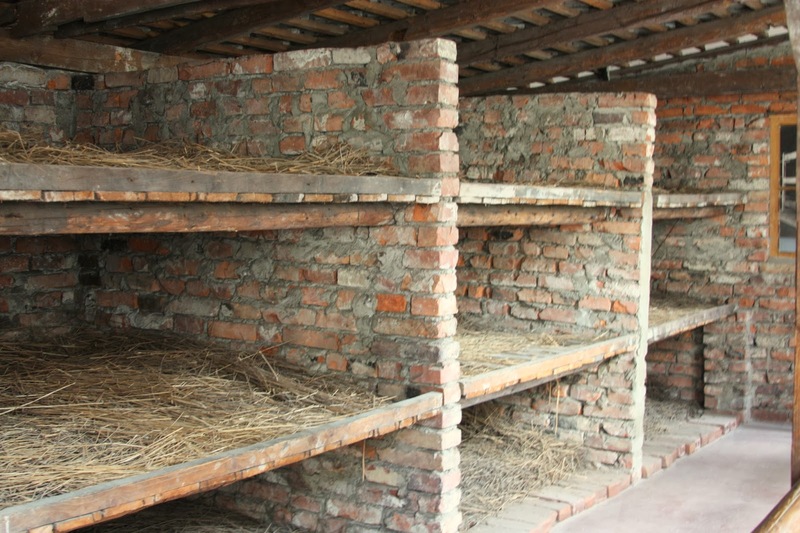 These are barracks from Auschwitz I, surrounded by electrified fences. These were originally Polish military barracks. After the Nazis defeated the Polish army, they took over the army base and converted into a concentration camp. When the Auschwitz prisoners weren't being forced to do slave labor, they were required to stand at attention for role call for hours on end, sometimes up to twelve hours. Russell is standing here next to gallows where some prisoners were executed by hanging. Upon arrival at the camps, prisoners were separated from loved ones, stripped of their limited possessions, shaved and tattooed. 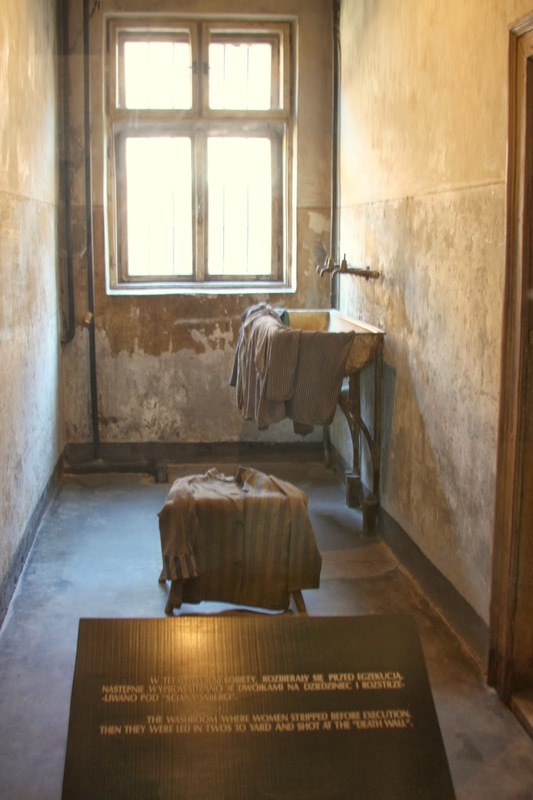 In one of the barracks, there are giant rooms completely filled with items such as suitcases, shoes, eye glasses, hair combs, even human hair. 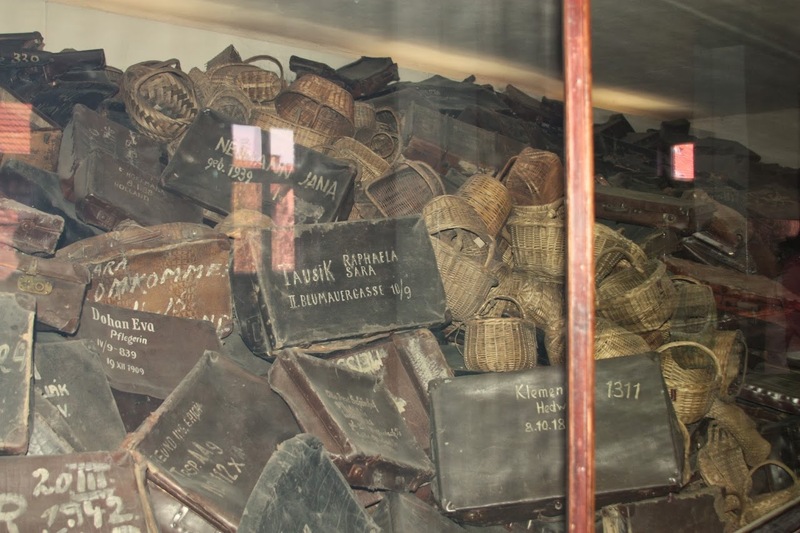 Seeing so many suitcases labeled with Budapest district numbers was a strong reminder that nearly half of the 1.3 million Auschwitz victims were Jewish citizens of Hungary. One out of every 10 Holocaust victims was Hungarian. 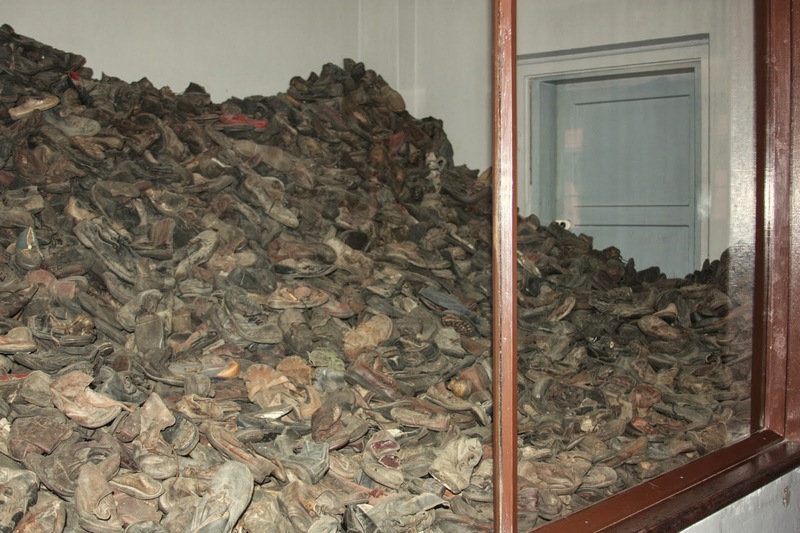 Looking at the last individual possessions of the Auschwitz victims, you can't help but imagine the lives of the shoes' owners. The living conditions were deplorable. Imagine countless individuals crammed together, sleeping on scant piles of dirty straw. Others slept packed tightly together, lying on their sides, on filthy straw pads. Note, that's a big fat "no picture" sign reflected on the glass in this picture... in case you are wondering, pictures ARE allowed at Auschwitz. They ask that you not take pictures inside some of the exhibits because of crowd control issues. We were there quite early in the morning, before the crowds, so the guides allowed me to take pictures and one actually explained the necessity of taking pictures... so that as many people as possible can see what happened here. This was the washroom were female prisoners of Auschwitz I were asked to clean up and undress before execution by shooting. For me, the most difficult aspect of Auschwitz was the child victims. 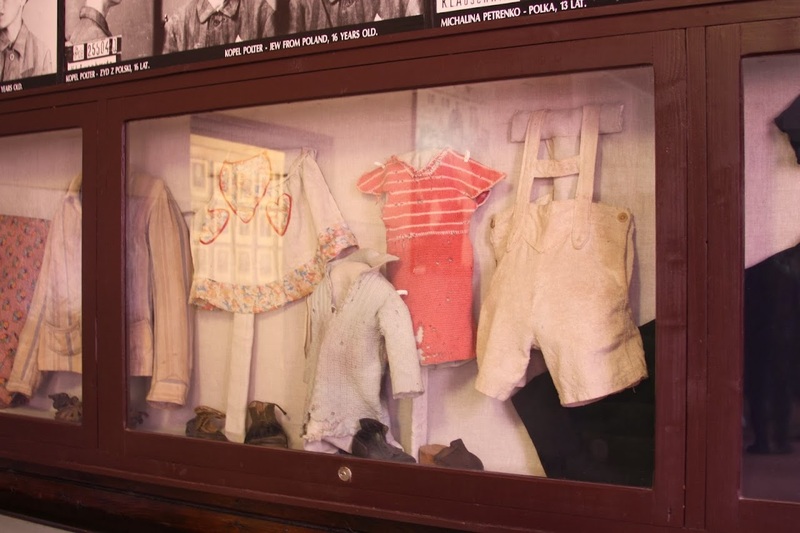 Seeing their tiny little clothes and possessions brought tears to my eyes. 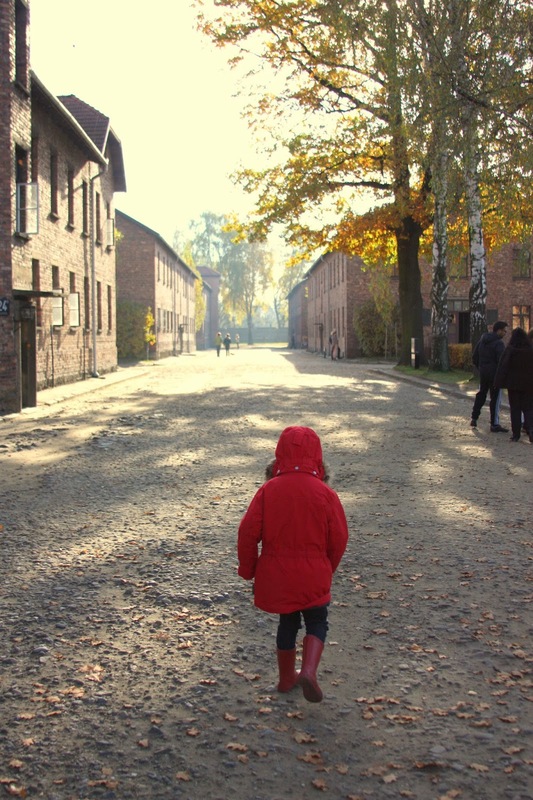 Most children were separated from their mothers and killed upon arrival at Auschwitz. They were considered too young to work. I will never fathom the utter lack of humanity shown to even the most innocent of beings. 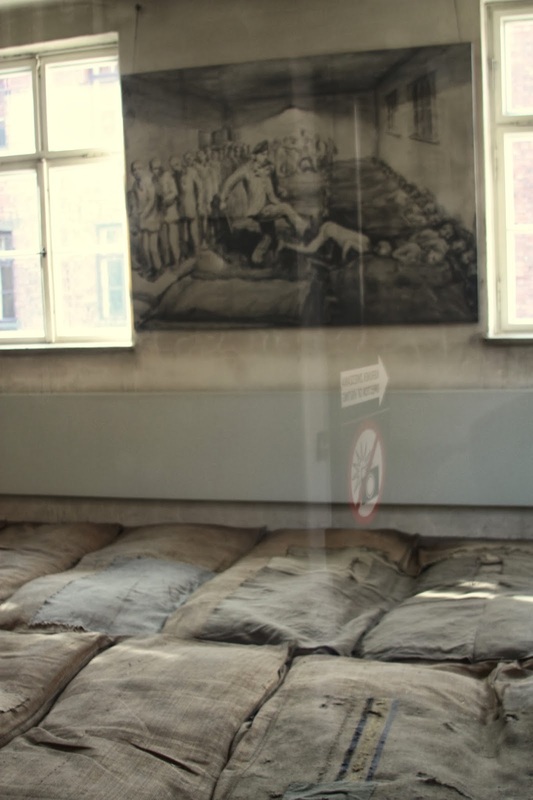 This is an image that appeared a few times at the Auschwitz Museum. 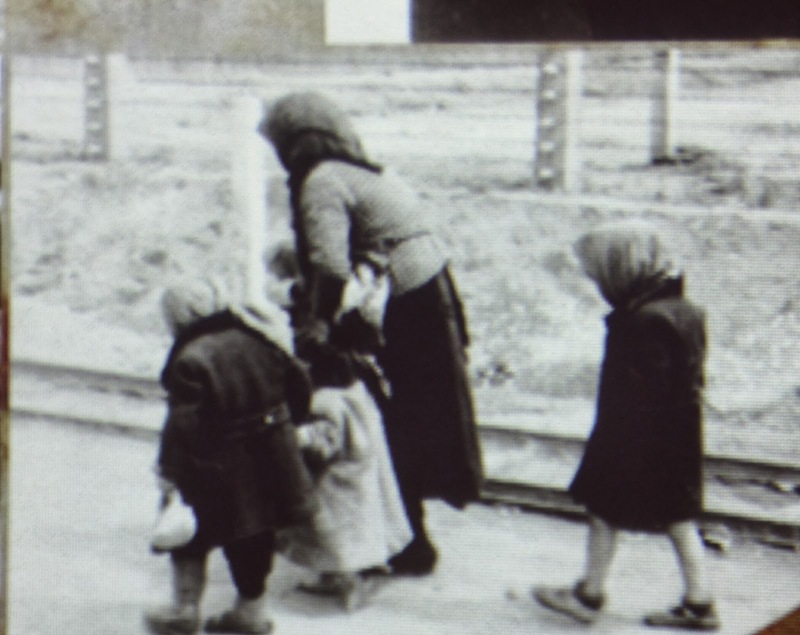 It's a group of small Hungarian children and an old woman walking to the gas chamber of Auschwitz I. If you have seen Schindler's List, you may remember the Auschwitz scenes when the train arrives at night through this guard tower. 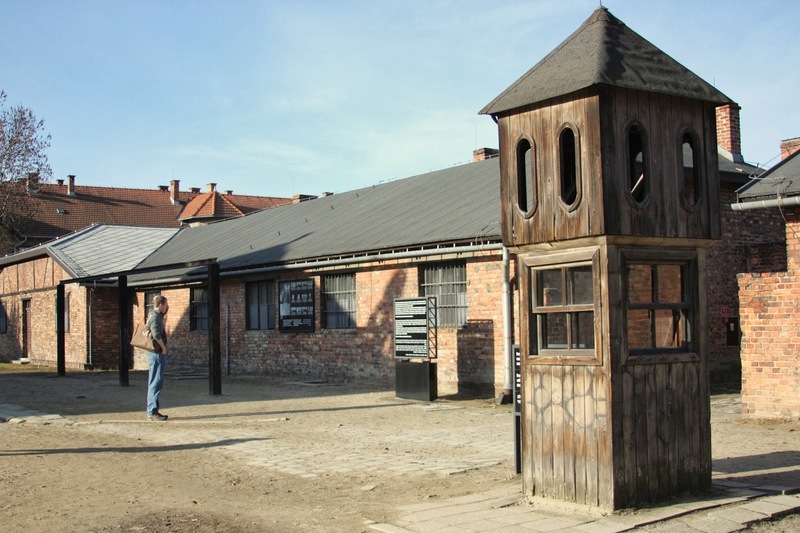 The Birkenau camp or "Auschwitz II" is a few miles from Auschwitz I. It was built as an expansion camp. It was built for killing. It had the capacity to hold 200,000 at any given time and had four crematoria operating to cremate 4,400 people per day. As for Patrick, he was thankfully oblivious to everything around him. He simply toddled all over picking up and putting down stones. These are the tracks that would bring in the rail cars, bringing in a steady stream of victims from all over Europe. Birkenau went on and on, as far as the eye could see, in all directions. At the time of its operation, it was all mud, no grass, with countless barracks holding as many as 1,000 victims. The Auschwitz camps were liberated on January 27, 1945 by the Soviet army. Those that weren't forced on a death march from the camps by the retreating Nazis were liberated from the camps. The Polish Parliament later voted to turn the camps into a memorial, to the 1.1 million people murdered here, and a museum to educate the world as to the atrocities that occurred here. As for Claudia, we didn't share the details as to what this place was. We just told her that some very bad people made innocent people come here to work. We told her that every single human life is precious and must be protected. We told her to stand up to anyone who says otherwise. And above all, love your fellow man. These are simple principles, but they must be taught. The Dr. Suess Book, Yertle the Turtle, which Suess based on Hitler's takeover of Europe, is a good place to start teaching this lesson. The book is an innocent lesson told through turtles, but provides a very solid lesson on fairness and equality. To end our time in Poland, we headed over to the Museum Fabryka Emalia Oskara Schindlera. It's the actual factory where Oskar Schindler culled out over a thousand Jews from the neighboring Ploszow Concentration Camp to come and work in his enamelware factory. He made a sizable fortune operating the factory and spent it all to save over a thousand Jews from certain death at Auschwitz. Steven Spielburg's movie, Schindler's List, captures the whole story brilliantly. 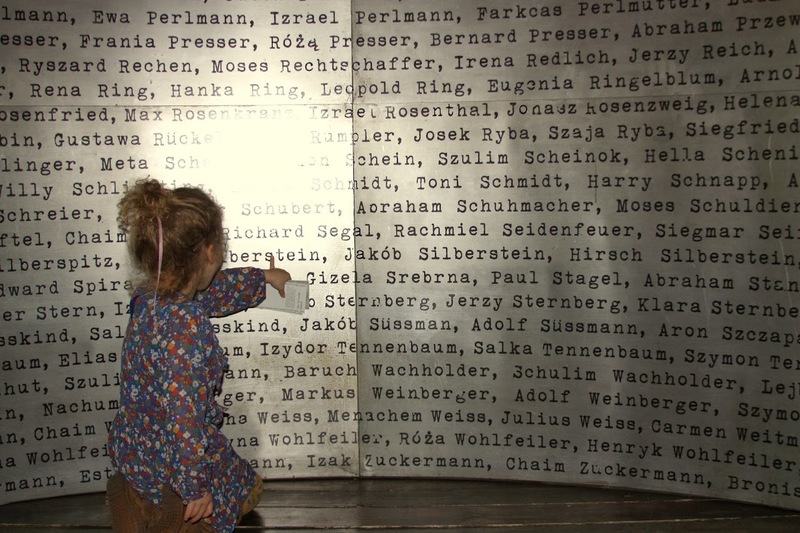 The Schindler Museum is very well done. It has an amazing library of pictures that chronicle the events in Poland leading up to and after the Nazi invasion of Poland. 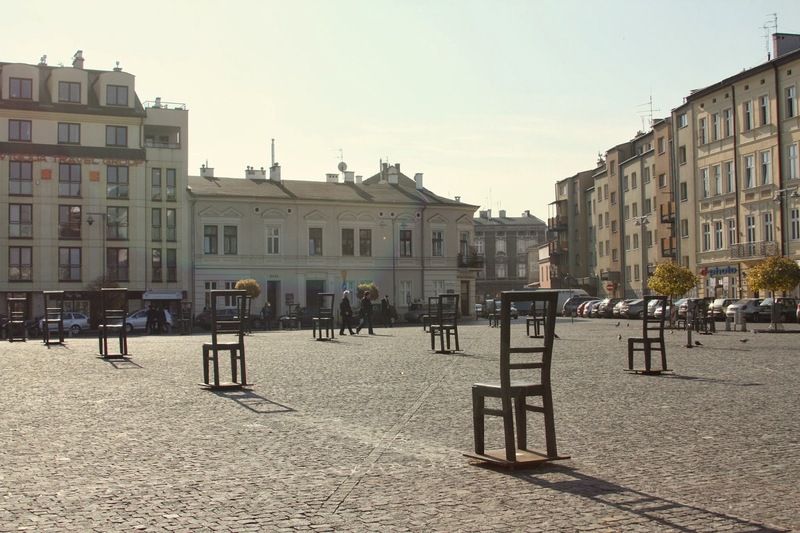 It provides replications of areas of Krakow, before the Nazi invasion, the ghetto conditions after the Nazi invasion, the quarry work camps and the concentration camps. The Museum is situated along the former Jewish ghetto area of Krakow. This is Ghetto Hero's Square today. A reminder that ordinary people, like you and me, were driven from their homes, chairs on their back, and forced into the ghetto. 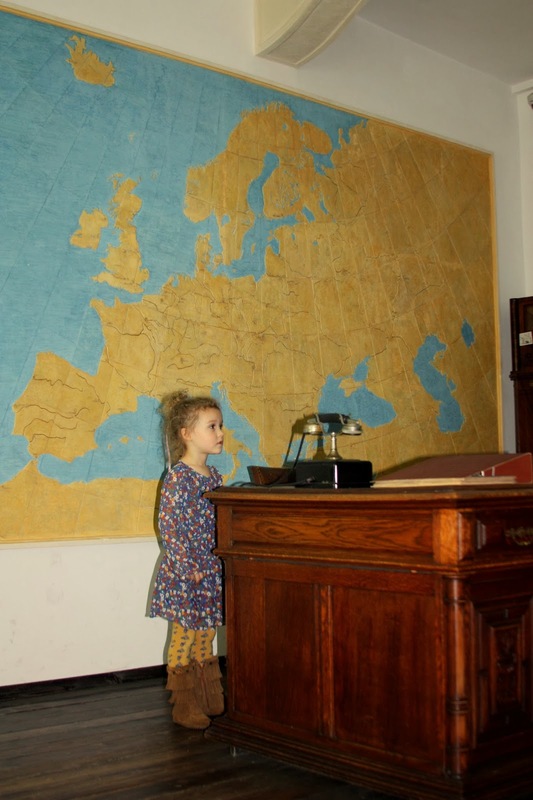 Claudia standing beside Oskar Schindler's desk, where he and Itzhak Stern, Schindler's accountant, a Jewish concentration camp prisoner, typed up the list of the 1,200 Jews whose lives would be saved by working in Schindler's factory as "essential" labor. 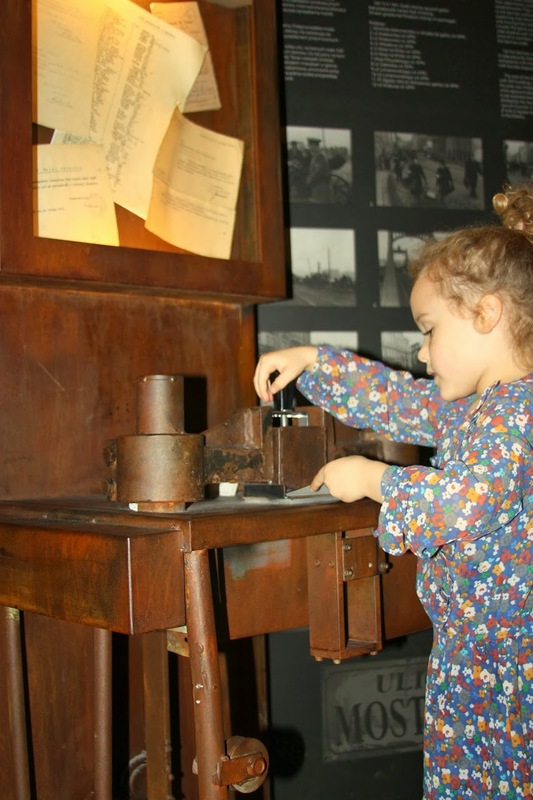 The museum provides numerous pieces of correspondence written by children. Claudia asked me to read many of the letters, which gave accounts, through a child's eye, of life in the Krakow ghetto. Many letters described a sense of community and fellowship within the ghetto. The writings demonstrated that, through their faith, they were able to remain positive, despite the turbulent and dangerous times. 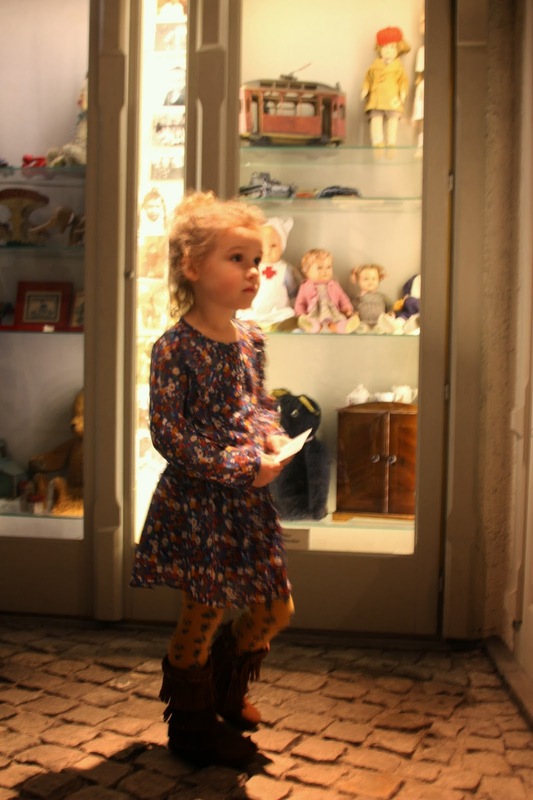 Throughout the museum, there were interactive exhibits that kept Claudia engaged and distracted. Again, we had to keep our explanations very high level to avoid sharing too many details. I know that eventually, there will be a time to share these details with her, but now is obviously too soon. 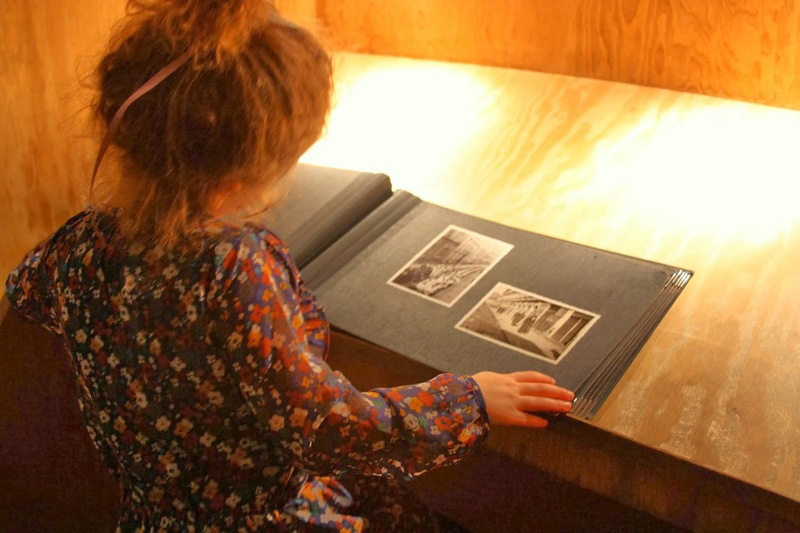 Claudia was most interested in seeing the pictures and items that depict life in Poland before the invasion. Again, with Claudia, we simply did not want to share details that would confuse or upset her. Leaving Oskar Schindler's factory, we did talk about the importance of always sticking up for someone if they are being treated badly or unfairly. The final message at the end of the museum was "Whoever saves one life, saves the world", which comes from the Talmud and was inscribed on the ring that "Schindler's Jews" presented to him after the liberation. It is a good message to remember. It is true that genocides are happening right now, in various corners of the world. Often, they are happening in remote parts of the world that we sadly know nothing or very little about. With respect to the Holocaust, it was happening across the entire continent of Europe. Ordinary people and children were being taken from next door, the office, the schools. Many turned a blind eye to their neighbors in peril. Some took huge risks to help a few. A few risked their lives and their savings to rescue many. I have to believe that one of the ultimate messages of the Auschwitz and Oskar Schindler Museums is that we as humans should value and respect the lives of our fellow man. If your fellow man is in danger and you have the ability to do something, you must do something. It's easier said than done, so it's something we should often repeat to ourselves. Oh gosh, I can only imagine what an emotional experience this must have been. 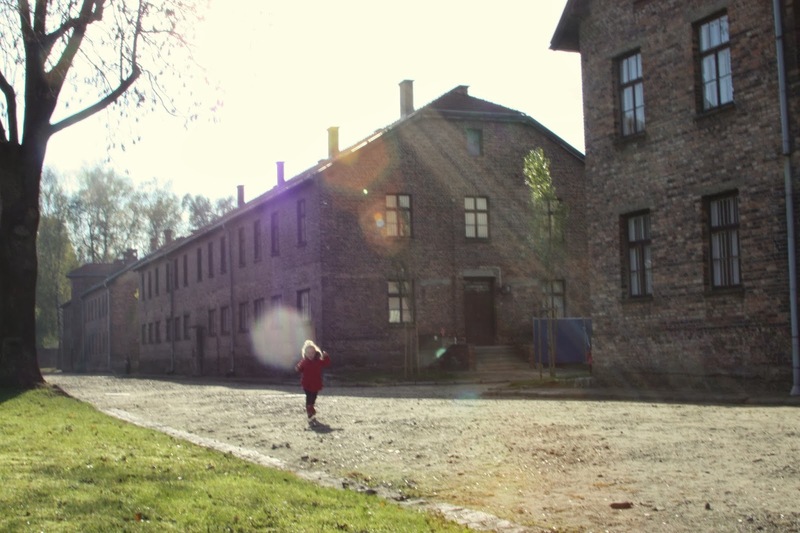 We wanted to go to Auschwitz while we lived in NL but I didn't know if I could handle it. (my grandfather was heavily involved in the dutch resistance & was regularly hunted for by the germans, my dad grew up during WWII). Really interesting reading your experiences going here! Luanna, that is so interesting about your grandfather. I'm sure he is a great source of pride to your family. It reminds us that this all happened in our not-so-distant past. If you guys haven't gotten his account down on paper, or as much of it as you can, you should so you can share it with your generations to come. I'm sure Oliver will be proud. Also, there is an entire barrack at Auschwitz dedicated to the Dutch victims, survivors and resistance at Auschwitz. It's very well done. I definitely thought having a kiddo along made the experience even more sobering. Sad, sad, sad. I remember when you went and I completely agree, Emily. When Russell was taking his turn, I scooped up Patrick, held him and just cried for bit. You hold your family much tighter after walking through Auschwitz with them. This just shatters my heart. I took a class on the Holocaust in college and to read about these atrocities is sobering and heartbreaking. But to see your pictures and read your narration makes this true in a way that is incomprehensible. 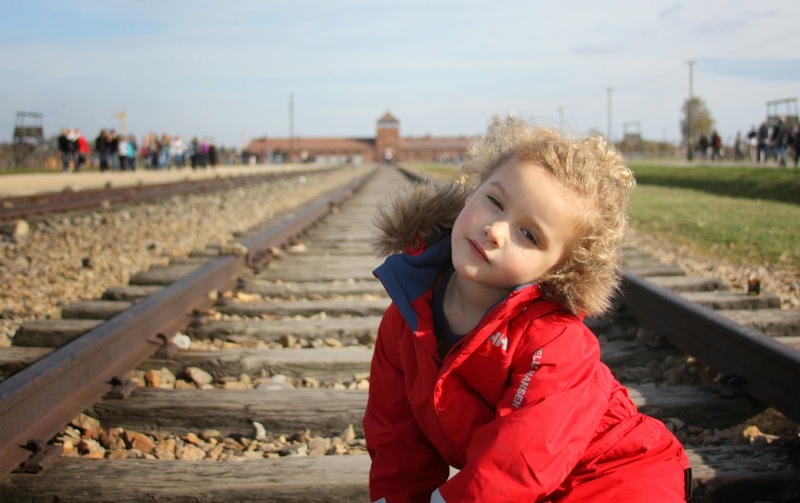 Your words to your daughter about Auschwitz made me cry. Seeing her in these photos makes my heart break for the blessing her innocence is and for how many children lost theirs in the camps. 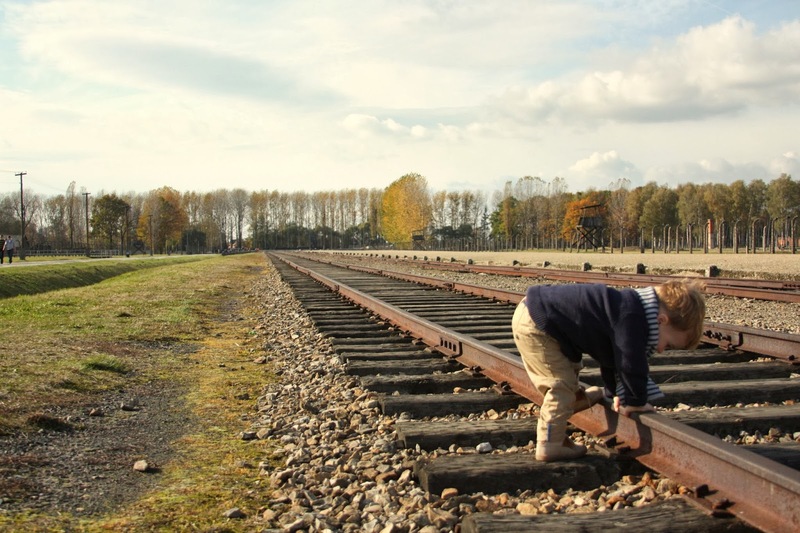 Your Patrick playing with stones by the railroad makes me laugh; it reminds me of another Patrick (my younger brother) who, when my parents took us the Mayan ruins of Copán when I was 7 and P was 4, was kicking stones of this national treasure just because he was bored. 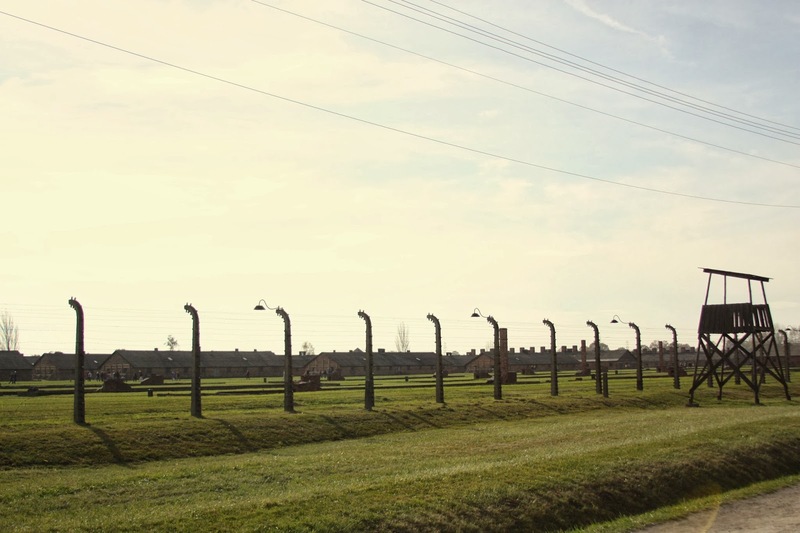 I want someday to see Auschwitz with my own eyes. I can't understand why I'm so strongly compelled; I think, though, if we know the evil of which we're capable, we will fight all the more vehemently to cultivate the good of which we're equally as capable. Hi Annie, I hope you can see Auschwitz someday as well. It does bring out some very strong emotions, some of anger, some of grief. You are exactly right, though, after you see it, there is a fire within you. Seeing it, seeing the proof that modern, civilized man, of the first world even, can commit such atrocities, it makes you aware that we must always be vigilant in respecting and protecting the lives of those around us. I really like your last comment about cultivating the good that are equally capable of. That's a powerful line of thought and I agree. Wow. Thank you for sharing this experience. I can't even imagine what it's like to see in person the sites where such unimaginable atrocities took place. The part that scares and shocks me the post is when I think about how this all really didn't happen ALL that long ago. Truly frightening. I am currently reading "The Book Thief" which takes place in Nazi Germany and involves the family of a little girl who is hiding a Jewish man in their basement. So far I really like the book and would recommend it. This was another reason I loved reading your post (as difficult as it was to read/see)- this period in our history has been on my mind recently because of this book. 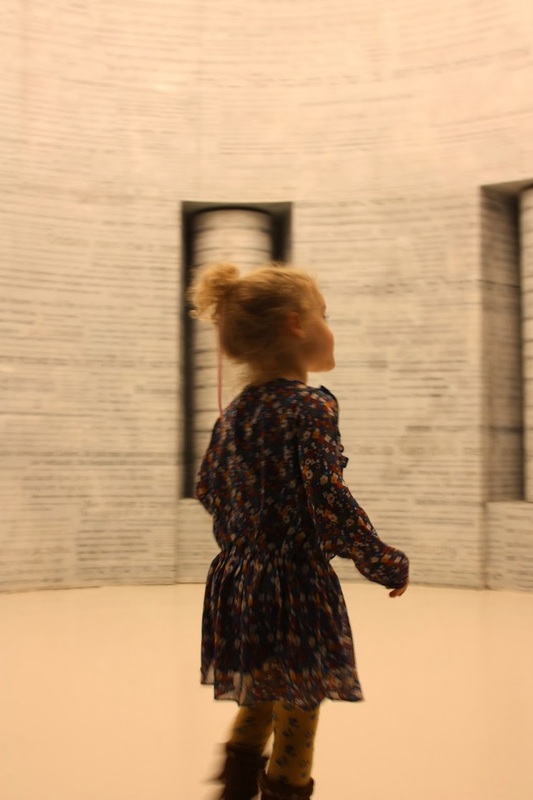 I love the way you handled explaining this experience and its significance to your daughter. Now you've got me wanting to re-read Yurtle the Turtle and watch Schindler's List (which I've actually never seen). Hi Megan, "The Book Thief" sounds like a very good read. I am especially amazed at those survivors that were able to conceal themselves within Nazi Germany through all of this. And I can only imagine the lengths that this family, and others like them, had to go to, to protect the lives of others through such perilous times. Whenever you are ready for another read that touches on this subject, I highly recommend "His Name was Raul Wallenburg", the true account of a Swedish diplomat that funneled tens of thousands of Jews out of Budapest by issuing them Swedish passports and arranging for transport to Sweden. A truly amazing story. And yes, re-read Yurtle the Turtle and watch Schindler's List! We did the same the week before we went to Poland. Thank you for sharing about "The Book Thief". I'll add it to the list. Beautiful post about a horrific place. I can't imagine taking my own children to a place where children were discarded so easily and not be touched. Thanks for sharing. Agreed, Lynda. I think anyone with children or the love of children is especially affected seeing the exhibits about the children of Auschwitz. But taking your children is tough. I had a very difficult time composing myself during and after the tour, but for the sake of the kids, you just do. It makes you hold them extra tight afterwards. beautifully written Meryl. The pictures brought tears to my eyes. I've read several books but seeing photos makes it more real. I am consistently shocked to think this was only 70 years ago. The way you handled explaining to Claudia was very wise and we would have done something similar. I feel the same way. When I grew up learning about it in school, it seemed like something that happened so long ago. I recently met a Holocaust survivor who was born in Budapest, sent to a camp, returned to Budapest following the liberation, was later given a one-way passport (i.e., deported) by the Soviets to Israel and returned to Budapest after living most of her life in Israel. Meeting her made me really think about how recent this all was. Your words are moving Meryl. How you tell the story sparks an interest in wanting to know more. I slept through every history class and as a result have had no interest...but when I read your blog, I am intrigued. The museum in Budapest was sobering enough, I can't imagine actually visiting here...maybe one day. Oh how I miss you! I haven't been by in a while, but am so glad you do all of this so we can see so much of this amazing world through your eyes! Oh wow- this just makes me so sad. I would have been bawling walking through there. What a sad, sad time in our history. How human beings could murder over a million people is beyond me. But here we are years later and our Nation says it is ok to kill an unborn baby, go figure. A life, is a life, is a life- no matter how small. Thank you for sharing this- very sobering to see pictures of things that I have always heard about but never could quite imagine.